PennsylvAsia: 2017 Takashi Miike film Blade of the Immortal (無限の住人) in Pittsburgh, November 3 - 9. 2017 Takashi Miike film Blade of the Immortal (無限の住人) in Pittsburgh, November 3 - 9. 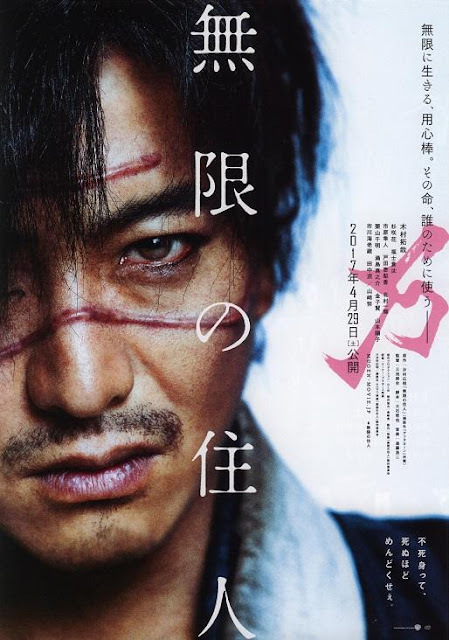 With a body count in the thousands and a breakneck pitch that starts at feverishly intense and only builds upwards, “Blade of the Immortal” is certainly one of Takashi Miike’s most lethal works. But then, how else should a director with Miike’s talents celebrate such a milestone? You see, not only is his adaptation of a popular manga overloaded, overlong and gleefully over-the-top – it’s also the director’s hundredth feature film. Based on Hiroaki Samura’s eponymous series, “Blade of the Immortal” follows Manji (local mega-star Takuya Kimura), a cursed samurai and unkillable killing machine who broods and maims his way across Edo era Japan. Thanks to the “sacred bloodworms” coursing through his veins, Manji can heal any wound and ages in slow motion, and that’s not the only similarity to a certain Marvel hero, as this film also hinges on the relationship between the older sell-sword and young girl he’s paid to protect. Tickets and showtime information is available from the theater's website; the movie plays at 9:00 pm each night from the 3rd through the 9th. The theater is located at 1449 Potomac Ave. in Dormont (map), and is accessible by Pittsburgh's subway/LRT at a block south of Potomac Station.